Now that is awesome! It is great that you have a school of a size to do that. It isn’t possible for many reasons here, not least of which is hoodlums who purposefully destroy them or dump chemicals like antifreeze in them. It is so very nice to see that this kind of good and lasting learning is still happening in the world. Those beds look incredible and I’m envious of your lovely sheep poop compost! whoa. You guys lost not time in framing those beds, now, did you. I suppose there were none to be lost either, was there? Your school has sheep? How wonderful is that! Who takes care of them during the school holidays? I am so impressed and full of admiration. Such an important thing to do! Thank you! I love that you helped get packaged foods out of your kids school. My boys aren’t in elementary yet, but the school next door does have a great big garden. I can tell though through walking in it that only a few teachers are really into it. Maybe once my boys start going there I can get more involved. This is the best thing I think a school can do for its students, in so many ways. The heath benefits, yes, but the investment/planning, science, sociology and economy of food production, and just fun seeing git grow. As Deborah said, this makes me admire you all the more. I am just starting to work with a children community garden here, and the more I learn the more excited I am. If you have ideas/tips, I’d be grateful if you can share your successes. That’s a very cool looking garden. I really like the simplicity of the frames. Are those 2 x 8s? And what was the source of the soil? Is it really topsoil? Compost? A mix? I built a large container garden at my daughter’s charter school. It was a great challenge and loads of fun, especially the harvests and watching how excited the kids were to clean and peel and prepare the food. But the administration at the school has always been a mess. None of the other parents showed any interest. The teachers who had been active moved away. The garden languished. Some new parents have expressed an interest, so I am letting go of the garden. It does take a village. Those are lucky children. I hope the hesitant parents jump in and get their hands dirty-they don’t know what they’re missing. That’s just awesome… We’ve got a cooperative daycare here in town that my youngest goes to and my oldest used to. They do a spring garden there that I just keep thinking could be so much better! I should get off my duff and make it happen. Nice job! What orderly gardens! You folks are doing great work for your children. Our daughter’s school has organic gardens too, but like you said, it tends to ebb and flow based on who has the time and skills each year to help organize it. Our school is also small,~150 kids and no cafeteria. So we don’t have to worry about institutionalized food there. It would be nice though to have a veggie pantry of sorts… they currently have a pantry for low-income kids or kids who forget their lunch, but it’s full of non-perishable (sometimes not-so-great) things. How very satisfying to be able to use your passions in volunteer work. What I noticed right away instead of the garden is my favorite cooking thing.A Weber charcoal grill with a Weber charcoal tower.What were you going to cook.I went through three or four of Chain store Charcoal Towers that always came apart after a year or so and spent 5 bucks more on the Weber one which is now 7 years old.Pray tell what are Egyptian walking onions? Hi Christie. Yeah, well, hoodlums: what can you do? This is a fairly rural school, so, well, nobody messes with anything. Yeah, Sylvie, I had the wood delivered, chopped it up, carried it to school bit by bit and assembled the beds bit by bit. One other parent helped and he was a lifesaver (the things are heavy to move by yourself!). But yes, time’s a-wasting so they needed to be built. The sheep (they’re wonderful) go to a sheep farm for the summer but otherwise they’re here and cared for by the children. Ah, thanks, Deborah. Frankly I realized I had the knowledge to really take it on (if not the time) and I also realized if I set up something rather simple, it would both become its own marketing tool and the kids would love to be involved with it. The beds were a big step toward simplicity. Yeah, ASG, it would be great if you helped once they’re in school! I think that many teachers love gardening, but it can be quite daunting with all their classroom responsibilities to be completely involved in dirt-digging too. Well, MC, I’m just starting! I think what’s really important is to let things happen. I do have a garden plan, with what should go into which beds when, but honestly I don’t like the idea of being Queen, you know? So we will see how this evolves. Hi Ed. Yep, just 2x8s. The topsoil we got was pretty lovely, but frankly the school’s dirt is pretty nice too, fairly sandy/loamy. It would’ve been too much work to dig the paths up and into the beds so I just had the topsoil delivered. I do understand how “it takes a village,” and we’re kind of following The Edible Schoolyard as a guide. But I will tell you the Weed and Feed events do have great food and more importantly wine for the parents…and the garden IS in the play yard so the kids (and the sheep, which we let out of their pen) can help or not as they wish. Mostly, they help so it’s fun! Lindsay, yes, more or less, from 9 weeks to 9th grade. Pamela, I think the free gardening tips don’t hurt either! Dogear, yep. I kind of think gardening is pretty easy but not everyone agrees I guess! Hah, John! Yep that’s our tower from home and I will bet it’s at least 7 years old too. The grill, though, belongs to the gardens. We all brought our own things to grill, but most things were shared. 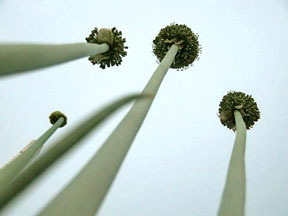 Egyptian walking onions are a type of multiplier onion that sends up this set of bulbils at the top of a flower stalk. The little bulbs get so big that the stalk falls over and plants itself in the ground! They’re great to use for scallions but the onions themselves are fairly tiny. Oh goodness Blaithin I meant to say that’s me pushing the wheelbarrow…I shall clarify. “Muck” is great soil to work with. There are two stream-side farms near us that have such wonderful soil and I get all jealous when I pass them. But yeah, rocks are pretty scarce! The downside though before you get all jealous is that paving stones that I want to edge around our pond are something like $4 EACH at the stores around here. Great idea and kudos to you! I’m always amazed that the schools let the snack industry run everything – the few times I’ve heard of parents backlashing or schools trying to get healthy, the snack food industry gives them more money and that’s the end. Doesn’t anyone have a heart or conscious anymore? Hi, I live in SW mich also and enjoy your web (first found today) it is amazing I bearly have time to think but very nice job. Do you know what % shade cloth to use for extending lettuce/spinach etc in the summer (in SW mich). I contacted MSU extension but they are trying to find the info but I thought maybe you would know.